Getting a crowbar in the safe door hasn't been England's problem in this failing raid down under. It's just that every time the loot has been within reach, the grizzled old guard dog has sunk his teeth into their backside. For all that this has been Mitchell Johnson's series, it has almost equally been Brad Haddin's. Three times now in three Tests he has growled his way to the wicket with Australia in trouble; three times now he has chased away the tourists and made safe the family store. For a 35-year-old whose Test career looked over for both logical cricketing and cruel personal reasons, it is a late charge that has changed the course of this Ashes battle. In a country where average means anything but ordinary, and ordinary means worse than the mean, there are two nasty numbers that might haunt England when they look back at the wreckage and try to work out where control was fatally lost. "There is a link between Haddin's performances and England not grasping the chances that are coming their way - he is becoming a real thorn in the side." One is Haddin's current series average of 80. The other is the contribution of Australia's sixth and seventh wickets, which are currently averaging 84 and climbing. England's comparative tally is 11.8. This first day of the third Test may have ended with Australia on 326-6, but it was not always such a frightener on a Friday 13th as hot as hell. An hour after lunch, Australia had been teetering on 143-5, just as they had wobbled on day one at the Gabba at 132-6 and 174-4 and then 257-5 in Adelaide. As on both those occasions, it was Haddin who first stamped out the smouldering sparks and then ensured England's hopes slowly went up in smoke. At the Gabba he had made 94 off 153 balls in the first innings and 53 off 55 in the second, at the Adelaide Oval 118 off 177. His 55 here, as part of a critical partnership of 124 with centurion Steve Smith, was not without chance, just as those earlier knocks had been full of calculated risk and happy slaps. But the gambling brought rich dividends. Only three other wicketkeepers in history have scored four half-centuries in successive Test knocks. One, Adam Gilchrist, enjoyed a valedictory tour of the Waca outfield during the tea interval. Another, current England coach Andy Flower, could have been forgiven for lobbing his cup and saucer against the dressing-room wall. Only the most one-eyed and ungracious could begrudge Haddin his late renaissance. It was while on tour to the West Indies last year that he first learned that his 17-month-old daughter Mia had been diagnosed with neuroblastoma. While she battled that cancer, any thoughts of Test cricket effectively left his mind. For a year Haddin and his wife Karina shared parenting duties, one staying with Mia in the Sydney hospital where she received treatment, the other at home looking after their sons Zac and Hugo. "The priorities were simple," Haddin said recently. "If things with Mia weren't going in the direction we wanted, there was no way I would even consider a comeback to cricket." By March this year, Mia happily discharged and back home with her brothers, that moment came. Stand-in stumper Matthew Wade injured his ankle before the fourth Test against India; Haddin stepped back in. When Shane Watson resigned as vice-captain in the aftermath of that series's thrashing, he was the obvious choice to bolster an inexperienced and ineffectual side. "England wouldn't have wanted to see him back in the squad," said former captain Steve Waugh at the time, with customary perception. Tugga, as ever, seldom pulls punches. The England bowlers who have laboured throughout this Ashes series must be sick of the sight of Haddin, who like his baggy green antecedents Gilchrist, Ian Healy and Rod Marsh, loves nothing more than punishing English cricketers and then telling them all about it as they stand there sweating impotently. Those who have arrived late will have little fondness for him either. Between inducing an early top edge that fell just short of the fielder and being biffed back over his head for the six that brought up Haddin's 50, poor Tim Bresnan spilt more perspiration on his recall to the England team than his home town of Pontefract must have done all month. 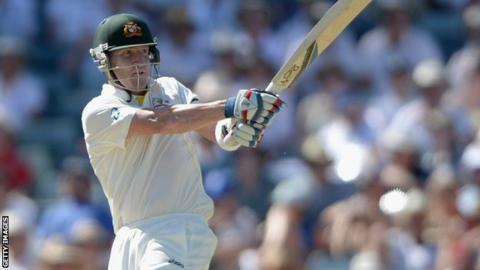 "Haddin is the traditional, hard, old-school Test cricketer. He doesn't care how he looks as long as he achieves it and he's definitely doing it for Australia this series." Temperatures of 39 degrees are as rare in West Yorkshire as tidal waves. So too are cricket pitches with the consistency of concrete, but this Waca wicket is once again proving a road to ruin for bowlers raised on green tops and grey skies. All four of the best bowling averages in this series now belong to Australians. So too do the top six batting averages. When Smith went to a century full of pulls and leg-side crunches, it was the fifth ton made by an Australian in four not yet completed innings. Not a single Englishman has made more than 87; so one-sided is this contest becoming that Johnson alone has scored more runs than any England batsman. Men have grown grey and old waiting for rain in western Australia, so the weather cannot save England. It is win or bust in Perth, which means Alastair Cook's men must take the remaining four wickets for less than 80-odd runs if they are to have any chance of keeping the series alive. Even then they must bat better than they have in their last 20 Test innings, rattle their free-scoring opponents out for far less on second bite and chase down the sort of score that they have historically struggled to do on this graveyard for English ambitions. It can be done. But Haddin, all narrowed eyes and punter's instinct, would not be alone in not betting on it.